Arturo Delmoni, Concertmaster of the New York City Ballet, is one of the most celebrated artists of his generation. His remarkably distinctive playing embodies the romantic warmth that was the special province of the great virtuosi of the golden age of violin playing. 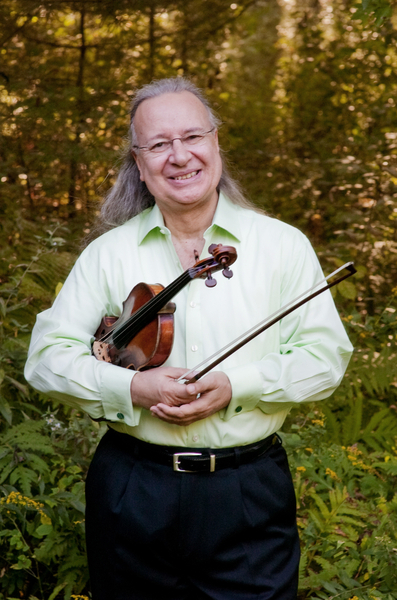 Yo-Yo Ma describes Delmoni as “an enormously gifted musician and an impeccable violinist. His playing style is unique, and his gorgeous sound is reminiscent of that of great violinists from a bygone era.” Glenn Dicterow, Concertmaster of the NY Philharmonic, says “Delmoni’s playing always goes right to the heart and his charisma is irresistible.” Delmoni’s stylish, elegant interpretations of classical masterpieces have earned him critical acclaim in the United States and abroad. This season marks the 50th anniversary of his Carnegie Hall debut where, at the age of 14, he performed the Tchaikovsky Violin Concerto with the Little Orchestra Society under the direction of Thomas Scherman. He has appeared with major orchestras across the country, including those of Dallas, St. Louis, Boston, Los Angeles, and with the NYCB Orchestra in New York. He has appeared as a recitalist throughout the US and Europe, as well as Japan and Hong Kong. As a chamber musician, Delmoni has performed with illustrious colleagues including Mr. Ma, Pinchas Zukerman, Emanuel Ax, Elmar Oliveira, Nathaniel Rosen, Jon Kimura Parker, Jeffrey Kahane, and Dudley Moore. He regularly appears at chamber music festivals throughout the country during the summer months. Arturo Delmoni’s violin is a J. B. Guadagnini, 1780. This website, NYCBO.org, is owned and operated by the musicians of the New York City Ballet Orchestra. This website does not represent the views, positions, or opinions of New York City Ballet, Inc., but only those of the musicians and their Union, Associated Musicians of Greater New York, Local 802, AFM. Any reference to the New York City Ballet, Inc. or New York City Ballet Orchestra is used herein to describe and convey purely factual information, events and material relating to the musicians who are Members of the New York City Ballet Orchestra at the present time as a protected fair use under the trademark laws of the United States and other laws. No association, sponsorship, or affiliation exists between the Associated Musicians of Greater New York and the asserted trademark owner, and no suggestion of such a sponsorship between the Associated Musicians of Greater New York and New York City Ballet, Inc. is made, express or implied. Any trademarks or other legal rights of third parties shown herein are the property of their respective owners.